Total Area: 1400 Sq. Ft. 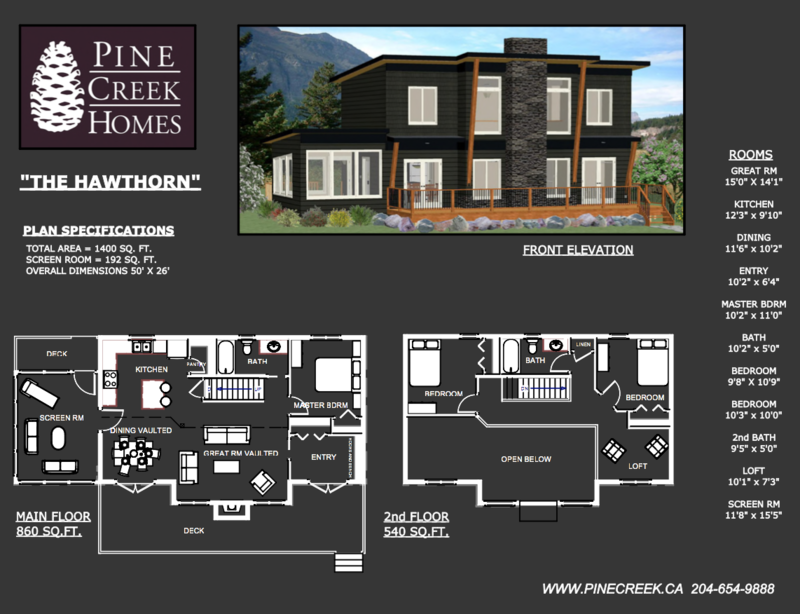 Originally designed as a cottage, the Hawthorn plan is also well suited as a home. With open spaces and a modern look, this plan garners a lot of attention. Clean architectural lines, mixed with a few timber accent support beams, provides a nice blend of rustic-modern charm. After walking through the entry, you come into the main floor living and dining area with 17-foot ceilings that are open to the second-floor loft, which provides a very spacious feel on the main floor. This also allows for larger windows to maximize natural light in this space, making it all work extremely well with the open concept of the main floor. This plan is extremely cost effective, as it packs a lot of features into a relatively small footprint. By limiting the number of corners and jogs, there are savings on both material and labour, making this plan an economical build. That, coupled with an efficient layout, keeps cost per square foot on the low end of the spectrum, making it even more appealing. A spacious kitchen with an island allows for plenty of working space, while still having a spot for stools around the island for eating or socializing while cooking. A walk-in pantry adds great storage space and convenience to this design. The screen room is a great place to get away from the bugs and still enjoy summer in the shade. The large windows let in a lot of light and provide great airflow on those hotter days. It’s becoming increasingly popular to upgrade the screens to slider windows, so the season can be extended in this room. Another great upgrade on this space is to insulate the screen room and add heating. This then provides a great space to read a book, do puzzles or work on a laptop during our cold Manitoba winters. The large front deck is perfect for eating outside in the summer, entertaining guests or simply drinking your morning coffee and enjoying the view. The rear deck is a perfectly protected spot for the BBQ, right off the sunroom, so you won’t have far to go in the cold months. The last, and one of the most important things to note about this and all of our other plans, is that these designs are simply meant to give you ideas for a starting point. Every home we build has its own custom plan, and we never build the exact same house twice. So, if you see something close to what you like, we can use that as a starting point, or if you don’t see anything you like, feel free to come sit down with us and we can draw you your own custom plan from scratch. We look forward to hearing from you!